Vacant lots constitute a huge thorn in the side of communities around Los Angeles. It isn’t just because they are ugly or represent missed opportunities. As I noted in yesterday’s piece, Blight Begets Blight, by embodying what appears to be the city’s disinterest in the upkeep of a neighborhood, vacant lots become magnets for trash and illegal dumping. In so doing, they remind residents that they really have little ownership over the health and well-being of their own neighborhoods. It hurts a community’s self-esteem and can impact economic development as well. For the guys that sit outside their barbershop and stare across the street at the two block-long lots that adorn Vermont Ave. just north of Manchester (pictured above and below, at right), it’s downright depressing. No amount of advertising or sprucing up of their storefront is going to convince anyone from outside the community that their shop and community constitute a great destination. 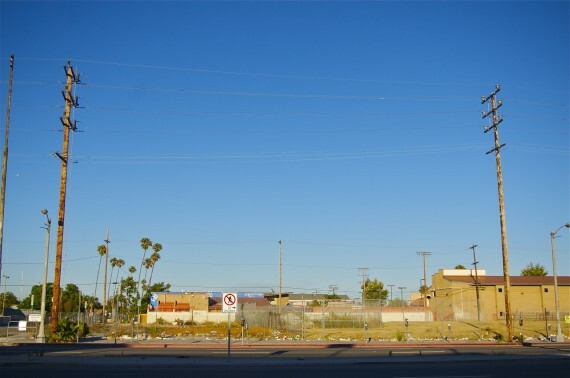 What organizers Israel Cruz and Fernando Mejia from the Los Angeles Neighborhood Land Trust (LANLT) are finding, however, is that while everybody unequivocally wants to see vacant lots transformed, each community has a different vision for the possibilities of those spaces. They’ve been taking note of these visions over the past few months at the community forums they’ve held around the city in support of the LANLT’s TILL program. TILL — Transforming Inner-City Lost Lots — is a project dedicated to cataloging vacant and surplus land within the city’s portfolio and identifying approximately 15 parcels that could be re-purposed to provide gardens and green space access to communities. The visions they’ve gathered at the forums will be incorporated into the development of an urban greening toolkit and website which will serve as resources for residents and community organizations looking to work with the city to take ownership of and transform the parcels. The unique visions and needs of each community has made creating a universal toolkit somewhat complicated. For many, Cruz told me, open space is not just about a healthy lifestyle, but an opportunity to connect to other issues. Residents at their South L.A. forum were interested in seeing lot transformation have a workforce development component that was geared toward harvesting the energy of area youth in a productive way. In the Valley, participants spoke about the need for more actively creative spaces, including space for a bike co-op. Others have wondered about the possibility of space for vendors in communities where they are part of the culture and urban fabric. Cruz and Mejia are excited to hear what new ideas Boyle Heights residents will bring to their forum tonight. While the TILL grant only covers the cataloging of city-owned parcels, that has been no small feat, either. City agencies haven’t always kept up-to-date records on their land or how (or whether) it was being used. The Land Trust staff and volunteers have had to visit each site to gather data on every parcel they’ve tracked, which number a few thousand as of now. Cataloging unused city land is also important in that these parcels are more likely to be made available to a community than a privately-owned lot. Private parcels are unfortunately often owned by people who have little interest in the well-being of the community. The lots along Vermont, for example, owe their poor condition to wealthy developer Eli Sasson, who has sat on them for more than 20 years and generally been an intransigent and unfriendly neighbor. Although the Community Redevelopment Agency (CRA) finally began eminent domain proceedings against Sasson in 2008 to wrest control of the land, the proceedings had to be abandoned with the CRA’s dissolution soon after. In more extreme cases, like that of the South Central Farm, land once granted for community use can become the subject of a political tug-of-war and can be taken back. The fact that publicly-owned parcels are more accessible doesn’t necessarily mean the process of transforming them is either quick or easy. But both Cruz and Mejia hope that their work will help people get a better understanding of how the process works and the role community members can play in making their neighborhoods more beautiful places. 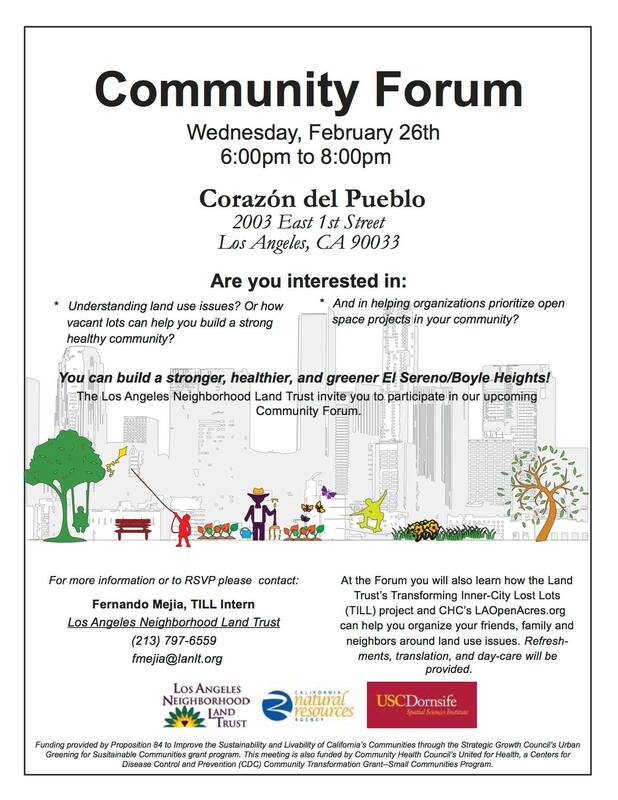 Come out to Corazon del Pueblo (2003 E 1st St.) tonight from 6 to 8 p.m. to learn more about the TILL project and the opportunities for transformation that might exist in Boyle Heights. Bring ideas for what you would like to see happen in your neighborhood. Or, volunteer to help be part of the land-cataloging process. The event FB page is here. More about the LANLT can be found here. They are also part of a collaboration with Community Health Councils, C-Lab, 596 Acres, and LA2050 to track privately-owned parcels of land as part of the LA Open Acres project. 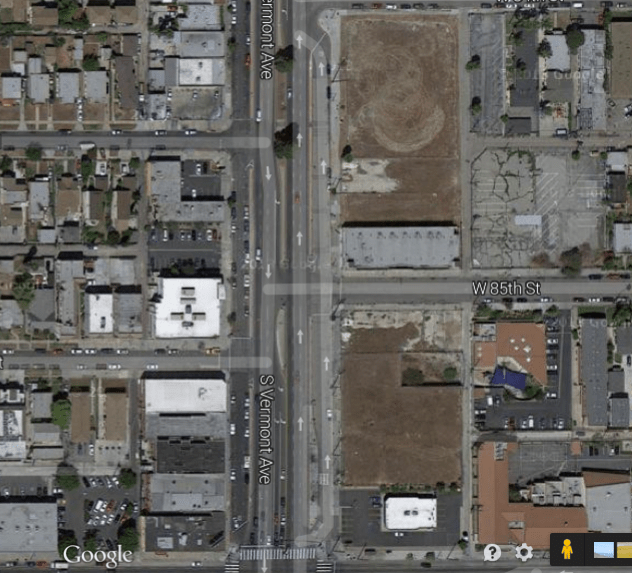 Blight Begets Blight: Vacant Lots are Popular Dumping Grounds in South L.A.